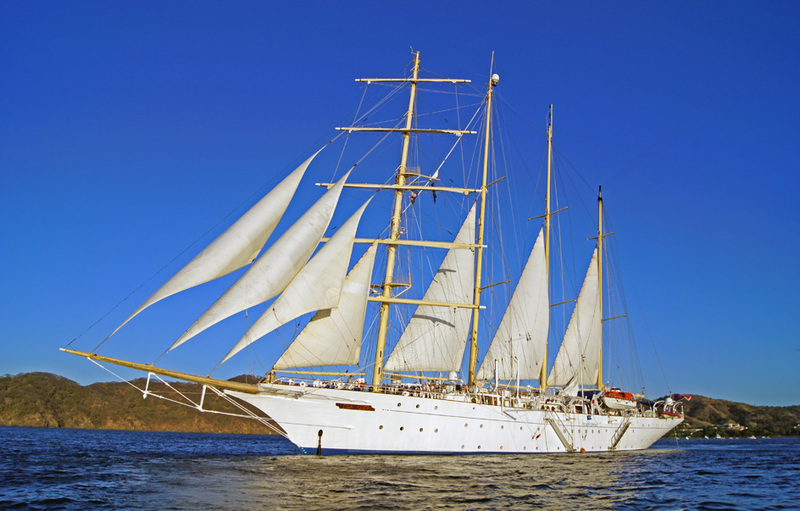 My favorite Tall ship cruise line Star Clippers is offering an exciting opportunity for yacht and nautical aficionados in 2014. Star Flyer’s Sept. 27 sailing will feature an overnight call at St. Tropez, France, during the annual Les Voiles de Saint-Tropez international regatta. Les Voiles de Saint-Tropez, which began in 1981 as La Nioulargue, attracts modern and classic yachts from across the globe that race for the coveted Rolex Trophy. In 2013 more than 300 boats representing 150 years of naval architecture and aesthetic participated in the event. 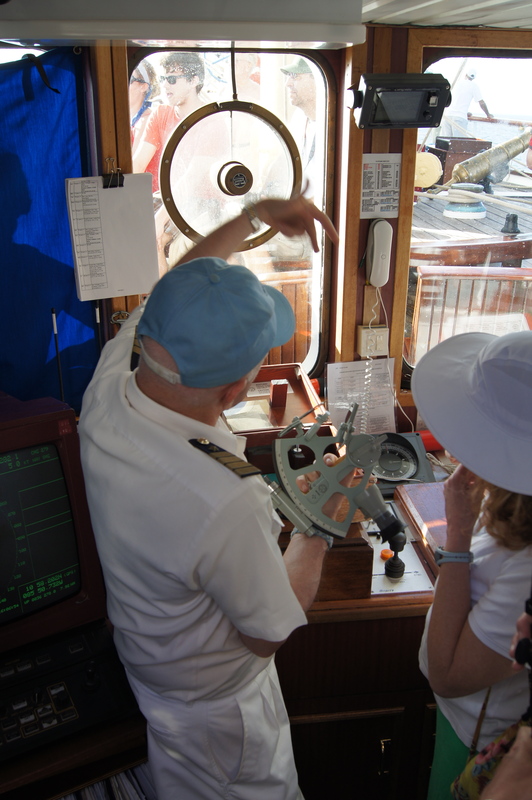 There’s always something to learn aboard a Star Clipper Cruise. In 2014 Les Voiles de Saint-Tropez will run from Sept. 27 to Oct. 5. Star Flyer will call at St. Tropez Oct. 2-3 during the event. Guests will have two days to enjoy the race and explore the most famous port on the French Riviera. Other calls on the seven-day, roundtrip Monte Carlo, Monaco, itinerary include L’Ile Rousse/St. Florent and Bastia, Corsica; Portoferraio, Elba, and Rapallo, Italy. Fares for the cruise start at $1,986 per person, double occupancy, including port charges. Star Clippers combines the pampered lifestyle of mega-yacht cruising with the exhilarating thrill of sailing aboard an authentic clipper ship. Guests rediscover what sailing was like during the glorious age of tall ships while visiting intimate ports of call untouched by larger ships. Star Clippers recently was named among the Top Small-Ship Lines in Condé Nast Traveler 2013 Readers Choice Awards as well as Top Small-Ship Cruise Lines in Travel + Leisure magazine’s 2013 World’s Best Awards. To request a brochure, call toll-free 800-442-0556 or email brochures@starclippers.com. For information, call Star Clippers at 800-442-0551, email info@starclippers.com or visit www.starclippers.com to view a video about the line or take a virtual tour of the Star Clippers ships. Emirates Team New Zealand won the 30th anniversary Louis Vuitton Cup with a 3:20 victory over Italy’s Luna Rossa Challenge in the eighth and deciding race. The Kiwis, who beat Luna Rossa in the previous Louis Vuitton Cup in 2007, won the series 7-1. The victory makes Emirates Team New Zealand the official challenger to ORACLE TEAM USA for the 34th America’s Cup in the “September Showdown” beginning Sept. 7. 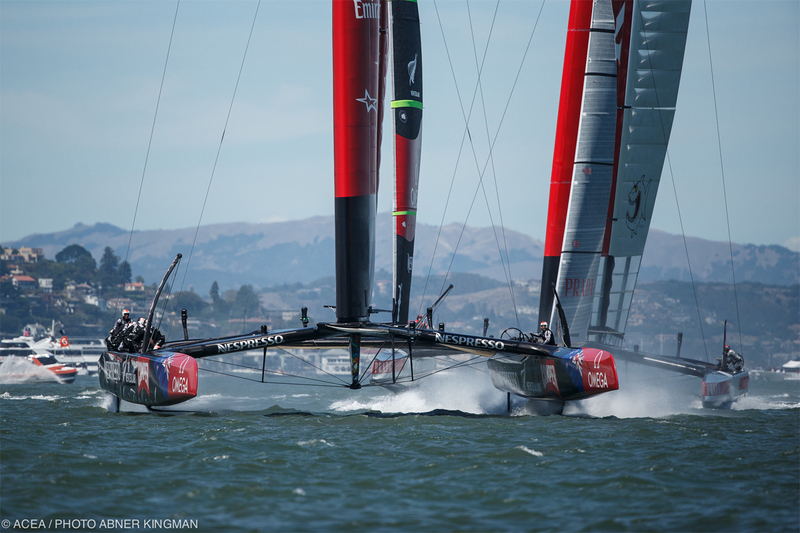 It’s the fifth time in the past six America’s Cup Matches that the Kiwis will be a contestant in the match. Emirates Team New Zealand led by 16 seconds at Mark 1, 1:31 at Mark 2, 2:58 at Mark 3, and 3:18at Mark 4. Luna Rossa made the final of the Louis Vuitton Cup for the third time in the past four contests. 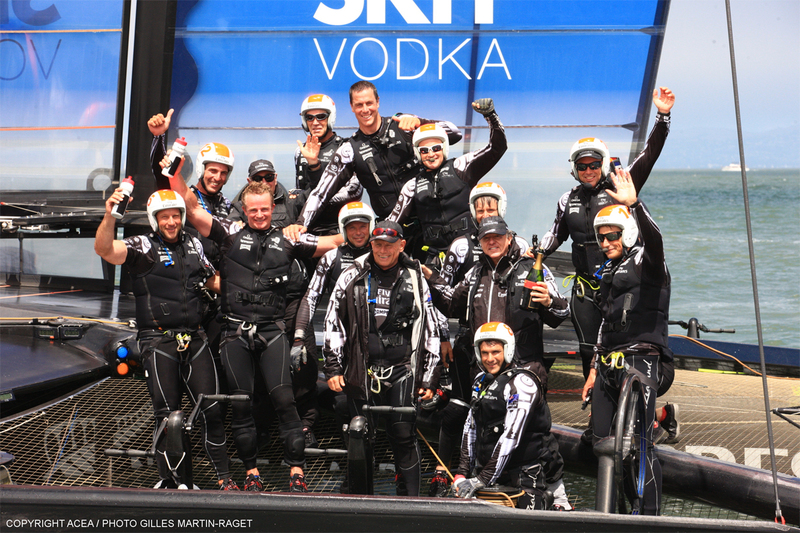 The widely popular team won the Louis Vuitton Cup in 2000 and finished runner-up to the Kiwis in 2007. The team came into the 2013 Louis Vuitton Cup as a late entrant, but has made great strides since the start of racing last month. In the end, they simply ran out of time. 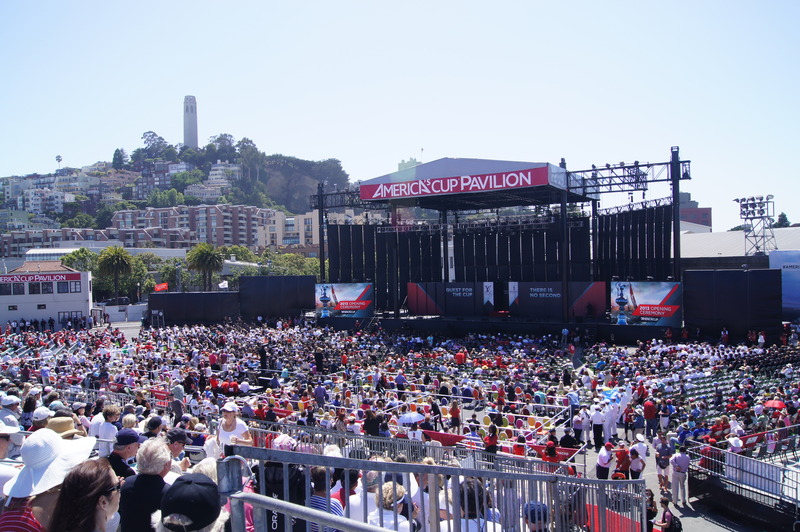 After months of waiting, wondering and lots of speculation, the 2013 America’s Cup finally opened yesterday on July 4th with the grand Opening Ceremony on the main stage at the America’s Cup Pavilion. 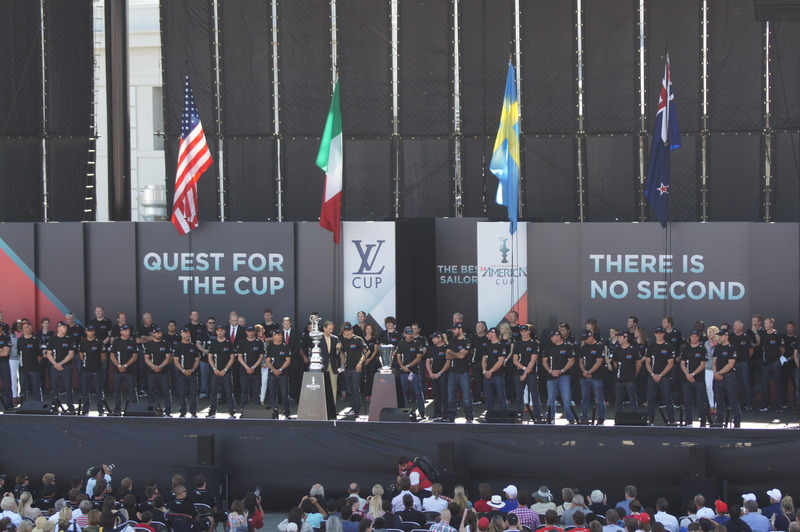 Sailors of the four teams contesting the 2013 America’s Cup—ORACLE TEAM USA, Emirates Team New Zealand, Luna Rossa Challenge and Artemis Racing were introduced to cheering crowds from their home nations and just about everywhere else. 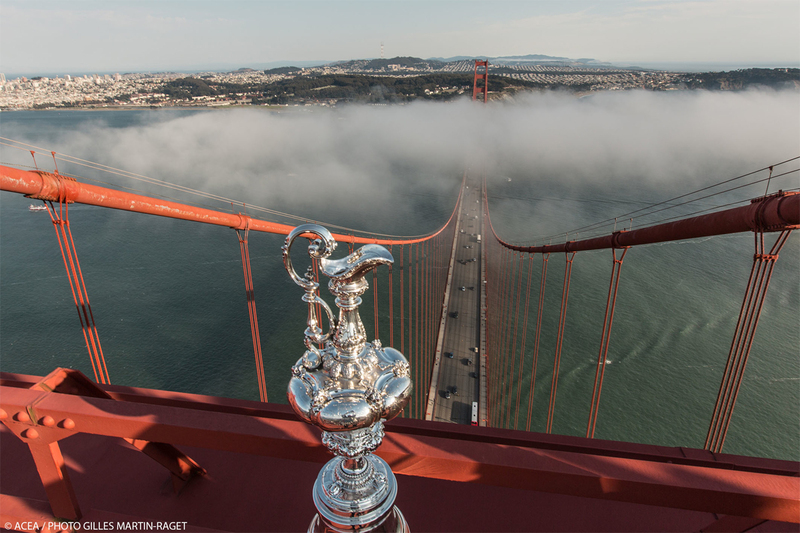 The 34th America’s Cup is being hosted in the U.S. for the first time since 1995 and will most likely be known from now on as the “San Francisco America’s Cup.” At least according to S.F. Mayor, Ed M. Lee. The Opening Ceremony featured cultural performances from the four competing nations, including the native New Zealand Maori performing arts group Te Waka Huia, by the tenor Pasquale Esposito from Italy, and Sweden’s Voices of Sweden Choir. The Recycle Percussion troupe performed a rousing rendition of The National Anthem on behalf of the U.S..
Additional performances were from Misa Malone, from the cast of Beach Blanket Babylon, who sang “San Francisco,” and Nayah Damasen, an 8-year-old from San Jose, Calif., who sang the National Anthem. 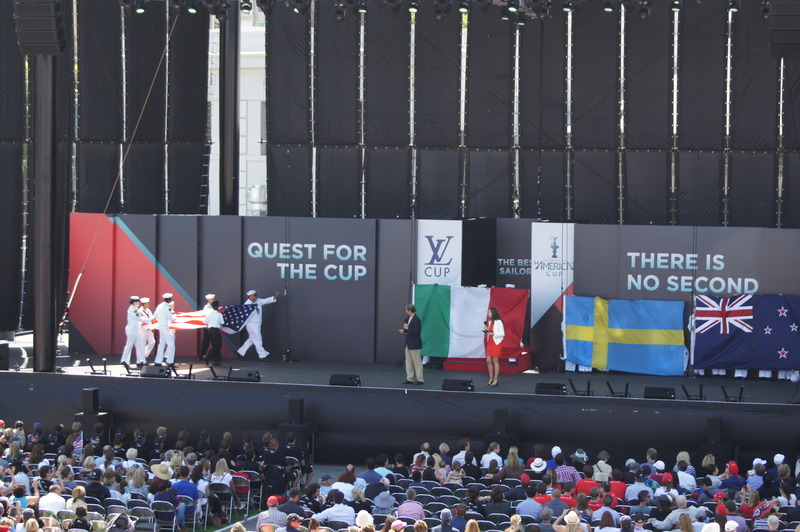 Representatives from the U.S. Coast Guard Color Guard and the United States Naval Sea Cadet Corps ushered in the American flag and the flags of Italy, New Zealand and Sweden. 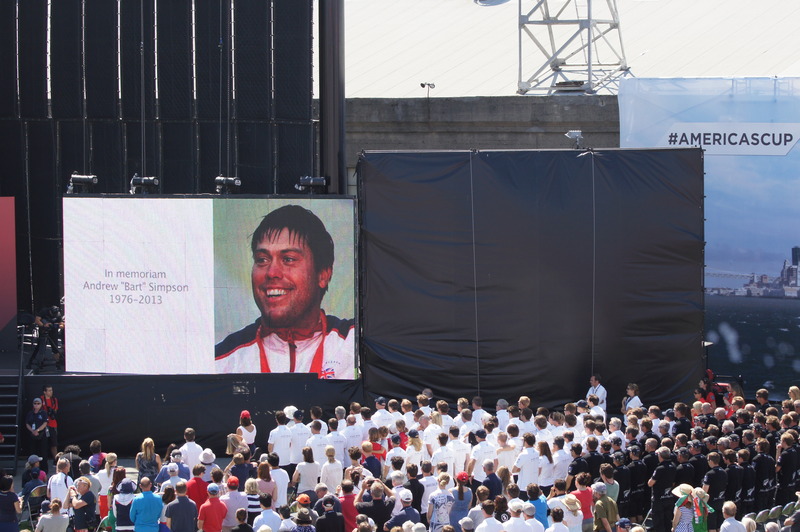 The ceremony included a poignant tribute to Artemis racing team member Andrew “Bart” Simpson, who was killed in an accident when their AC72 flipped over during practice. Teams honor fellow-team member Andrew “Bart” Simpson. The park officially opened shortly after noon time with San Francisco Board of Supervisors President David Chiu, Monique Moyer, Executive Director of the Port of San Francisco, Valérie Chapoulaud, the CEO of Louis Vuitton Americas, Charlotte Schultz, the Chief of Protocol for the city and county of San Francisco, and the ACEA’s Barclay, participating in a ribbon-cutting ceremony at the entrance to the America’s Cup Park. The AC72 Time Trials that were scheduled for today have been canceled due to strong winds this morning. The boat parade will continue as scheduled, including the replica of the yacht America, but there will no AC72s participating. On race day afternoons throughout the Summer of Racing, the America’s Cup Pavilion stage will showcase local performing artists free to the public. The Opening Weekend features five local bands with the first of these performances on Friday, July 5, from 3:00 pm to 5:30 pm PT. The headliner act is New Diplomat, an American Alternative – Electronic Rock band. Featuring members from around the world, the band formed in 2010 and has since gathered a significant following, blending a combination of alt rock, indie pop and electronic music. The opening act is The Five Hundreds, a San Francisco-based classic rock band that plays a mix of well-crafted original songs and high-energy rock and roll covers. 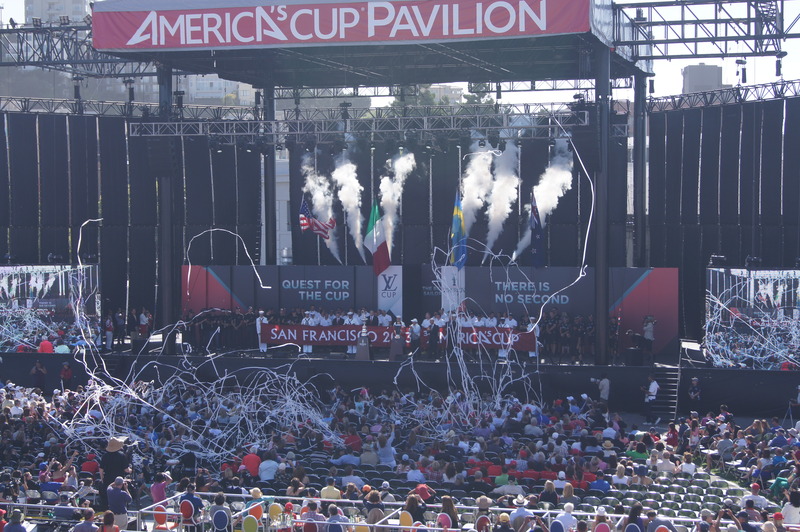 For the complete program and race schedule, visit americascup.com. 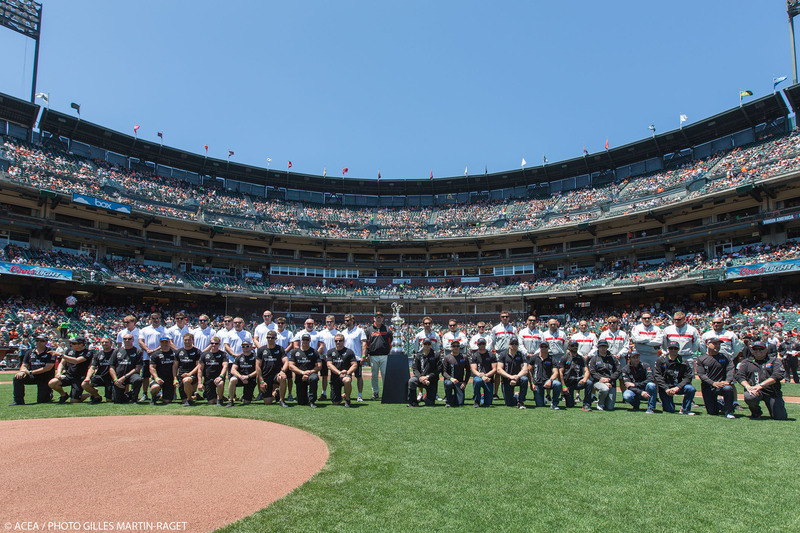 America’s Cup skippers Iain Percy (Artemis Racing), Dean Barker (Emirates Team New Zealand), Max Sirena (Luna Rossa Challenge) and Jimmy Spithill (ORACLE TEAM USA) shared the honor of throwing the first pitch at Wednesday’s San Francisco Giants game against the San Diego Padres. America’s Cup Teams meet the Giants at AT&T Park. Earlier, the sailors led their teams out on to the field of the World Series champions just before game time on Wednesday. 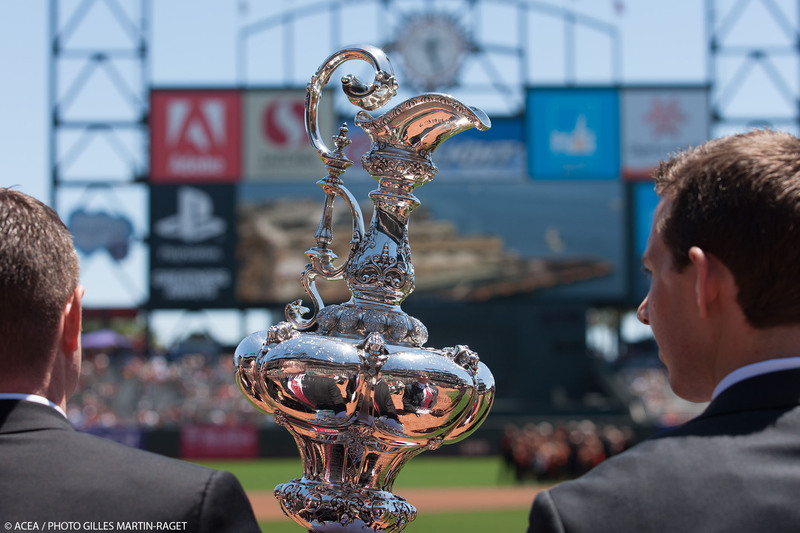 They were joined by the America’s Cup trophy itself, set up alongside the pitcher’s mound as the competition for the oldest trophy in international sport was celebrated at San Francisco’s AT&T Park. The Trophy comes to AT & T Park. 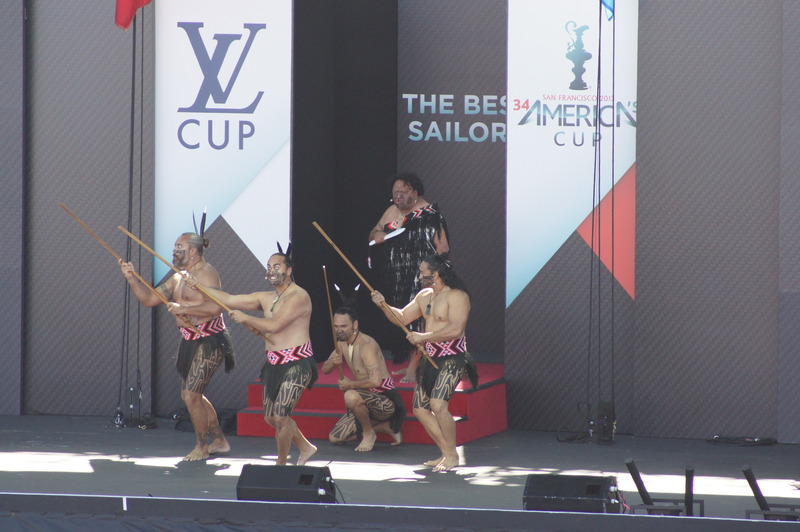 The first competition for the America’s Cup Summer of Racing was seen by baseball fans today as the four skippers fought good-naturedly over who threw the fastest pitch and who pounded a perfect strike into the mitts of Sergio Romo and Nick Noonan of the San Francisco Giants. The visitors from San Diego could boast a strong America’s Cup connection too. The southern California city was the last US city to host the America’s Cup, back in 1995, and prior to that in 1992 and 1988 too. San Francisco fans gave Artemis Racing an especially warm reception as the #sailonbart hashtag was shown on the Jumbotron, in memory of the late Andrew ‘Bart’ Simpson. Giants manager Bruce Bochy met the skippers and shook Jimmy Spithill’s hand. The hometown Giants won the World Series in 2010, the same year that ORACLE TEAM USA won the America’s Cup and brought it to San Francisco. The Giants have won a second title since and are the current World Series champions, so both San Francisco teams are fighting to defend their respective titles at the end of the summer. 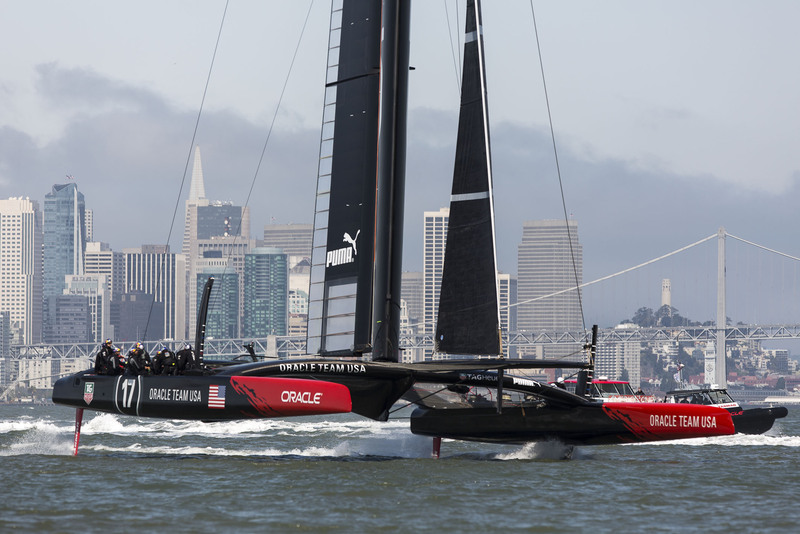 Spithill’s ORACLE TEAM USA will race in the America’s Cup Finals in September, while the Giants approach the midway point of their season in a battle for a playoff spot. Structural reviews of AC72 boats and wings, a 10-knot lower wind limit (23 knots maximum) and enhanced sailor safety equipment are among the 37 recommendations issued today to increase safety during the Summer of Racing at the 2013 America’s Cup. Many of the recommendations are intended to increase the personal safety of the sailors and they include buoyancy aids, body armor, crew locator devices, hands-free breathing apparatus and high visibility helmets. Other recommendations are specific to the AC72 yachts, additional support equipment and race management. Regatta Director Iain Murray, progressing the work of the Review Committee, presented his “2013 America’s Cup Regatta Director Recommendations” at a meeting with the four competing teams and the America’s Cup Event Authority on Wednesday afternoon in San Francisco. For reasons of insurance and liability, the Review Committee stopped short of making its own recommendations. Regatta Director Iain Murray has formulated the specific safety recommendations. These additional recommendations have been incorporated into the safety plan produced by the America’s Cup, which was forwarded to the U.S. Coast Guard today. The Regatta Director will now form a number of task forces to bring in experts to define additional technical recommendations for specific safety items such as protective gear for sailors. Since its first meeting on May 16, the Review Committee has worked diligently interviewing 25 team members including team heads, skippers, designers, engineers, sailors and support boat operators. 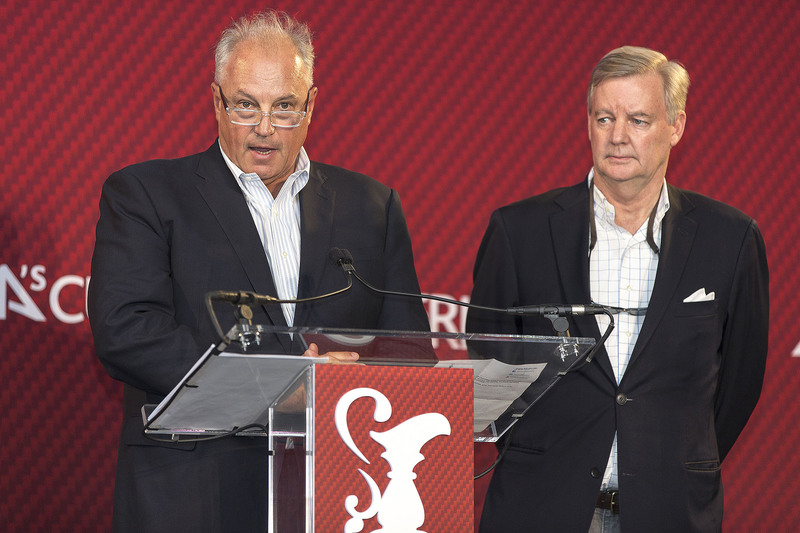 “I want to thank the members of the Review Committee for their exceptional and efficient work,” Murray concluded. 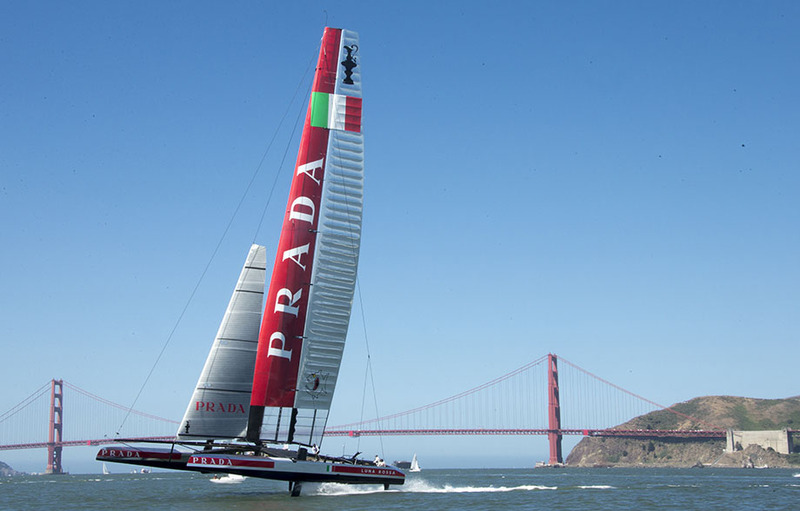 Last week, Luna Rossa had their AC72 out on the water for their first test in San Francisco Bay where the Louis Vuitton Cup and America’s Cup regattas will take place starting July 7th. 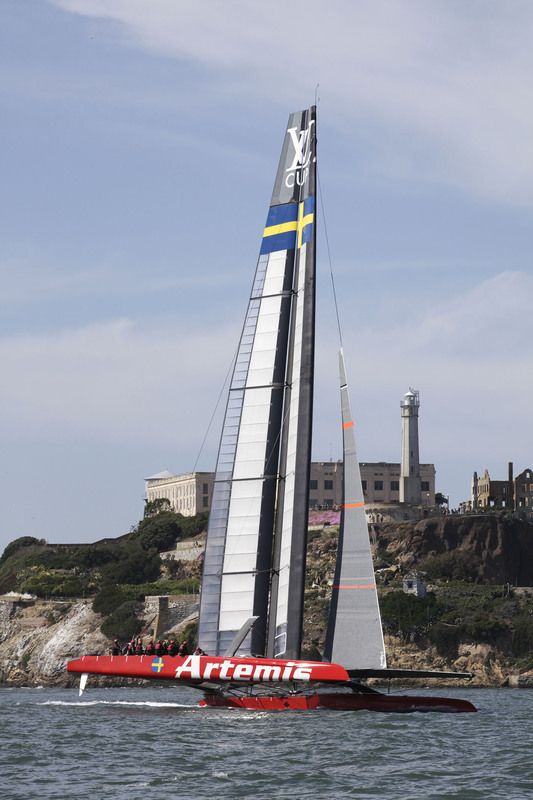 Luna Rossa Challenge sailed for the first time on San Francisco Bay on Saturday. With an early morning roll out, Luna Rossa sailed in light winds (3 knots) that increased up to 12 and allowed the crew to carry out an extensive number of maneuvers. The training session lasted about three hours. “Our prayers are with Andrew Simpson’s family, his wife and kids, and also the rest of my teammates. It’s a shocking experience to go through, and we have a lot to deal with in the next few days in terms of assuring everybody’s well being. 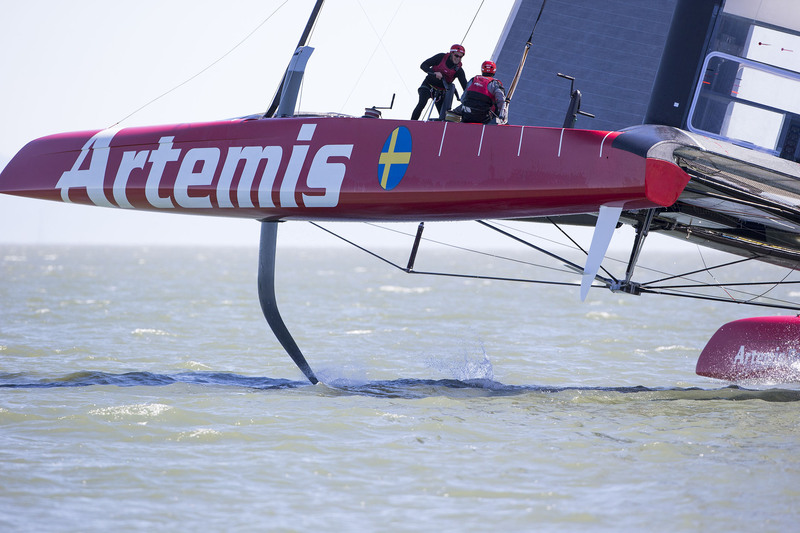 Simpson, a British double Olympic medalist, was one of the 11-man crew aboard Artemis Racing’s AC72 catamaran which capsized during training on San Francisco Bay ahead of this summer’s America’s Cup. All other crewmembers are accounted for. Simpson, however, was trapped underneath the boat and despite attempts to revive him, by doctors afloat and subsequently ashore, his life was lost. 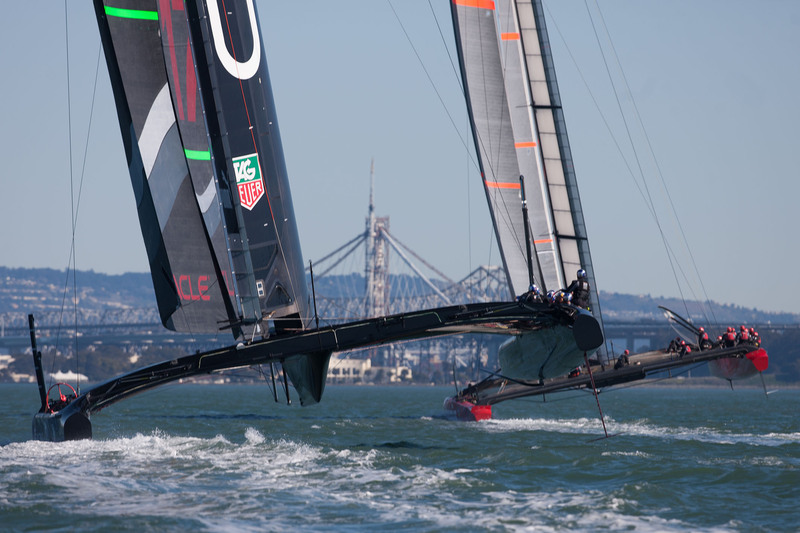 Artemis AC72 testing in San Francisco Bay. Cayard fronted a large media gathering at the team’s base in San Francisco but spoke for just one minute and didn’t take questions. “We have had a tragic day out on the bay today. Our thoughts and prayers are with Andrew Simpson’s family, his wife an kids and also with the rest of his team mates,” a clearly sombre Cayard said. “It’s a shocking experience to go through… and we have a lot to deal with in the next few days in terms of assuring everybody’s well-being. “The boat itself is under control but it’s certainly not the first of our concerns. We are focussed on the people. Simpson’s death will throw the spotlight on the safety and suitability of the massive craft for the looming Louis Vuitton Cup series (July 4) and the America’s Cup match (September 7). Countdown to the Summer of Racing on SF Bay. Go Team USA! This weekend the countdown clock will mark two months to the start of the “Summer of Racing” in San Francisco. An Opening Ceremony is planned for July 4 and will be followed on July 5 by a special fleet race for all teams. Racing in the Louis Vuitton Cup, the America’s Cup Challenger Series, officially begins on July 7 with a match between Emirates Team New Zealand and Luna Rossa Challenge of Italy. 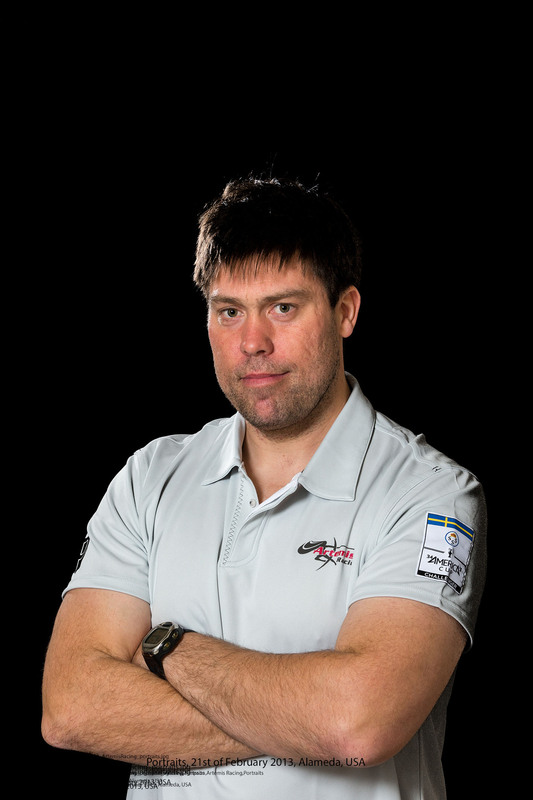 It continues on July 9 with Sweden’s Artemis Racing taking on the New Zealanders, and July 10 with Luna Rossa against Artemis Racing. Boat 2 First Sail / SFO April Testing Session / ORACLE TEAM USA / San Francisco (USA) / 24-04-2013. The top team at the end of the round robins gets to choose whether it advances directly to the Louis Vuitton Cup Finals or races in the semi finals. With a break of 12 days in the offing, presumably the winner would choose to go to the final and let the other two teams continue slugging it out in the semis. Throughout the Louis Vuitton Cup the defender, ORACLE TEAM USA, will also have access to the race course four days per week, Wednesdays, Thursdays, Saturdays and Sundays, sometimes sandwiched around the challengers’ racing. The America’s Cup Finals are scheduled Sept. 7-21, with racing set for Saturdays, Sundays, Tuesdays and Thursdays. The match is a best-of-17 series. Two races are planned each day, lasting approximately 30 minutes, and beginning at 1:10 pm PT and 2:10 pm PT. A break of approximately 30 minutes between races is mandated by the Protocol.